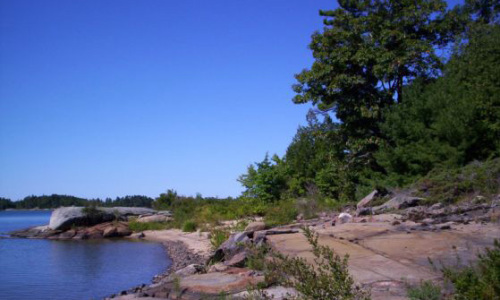 Fairies Dancing Reserve and the surrounding area is located in the center of the Pointe au Baril community, just west of the Shawanaga Channel. The property covers a large portion of the center of the island and protects the majority of the interior forest-barren complex as well as the extensive coastal wetlands located in three sheltered bays, two along the eastern shore and one on the western shore. In the bay along the eastern shore is a series of marshes that create an extensive wetland area of both meadow and shallow marsh communities. In addition, the property includes extensive areas of Eastern Massassauga Rattlesnake habitat. We had a new baby loon this summer!! It was very exciting. We have a loon raft in the back bay near Fairies Dancing. I first noticed the loon nest when I was kayaking around the bay. At first I thought it was an empty nest but I soon realized that we had one HUGE beautiful loon egg! How wonderful! I visited the loon raft for well over a week. I saw the loons out swimming and not too much was happening. One day when I kayaked too close to the raft, the loon appeared from no where and made it perfectly clear that I was not wanted and to please leave at once! Which I did. Two days later, I found the raft with the loon laying on the egg like a “halved chicken”! This loon was not sitting delicately on her egg, but completely smothering her egg! She was like this for a full day. And then they were gone. Everyone. The egg, the loons, gone. Was the egg eaten by the racoons? Hawk? Where did everyone go? I finally saw the loons in the back bay and tried to see if there was a baby riding on the back. It was hard to tell. I thought I could see something. And then, one day, to my delight, there were the 3 loons, swimming side by side with the baby in the middle. The baby had made it!! We watched some flying lessons later in the summer, some great crashes as it tried to land in the water. And now they are probably heading off for the big journey to the south for the winter. See you next summer!